La Luna is known for its quality meat dishes. 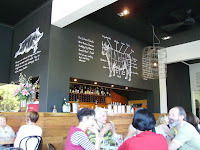 The restaurant houses its own drying room and the dining room provides ample food for thought while you wait to order or eat, with chalk drawings of a pig and cow, with the various meat cuts labelled, etched above the bar. On this sunny, yet below-average cool, first Saturday in autumn we were there as part of the Melbourne Food and Wine Festival's Express Lunch series. Several highly-regarded restaurants around Melbourne offer a two-course lunch (chosen from entree, main and dessert) plus a glass of wine, for $30. For entree, La Luna offered a lamb and lentil soup; baked figs; or house-made gnocchi in bolognese sauce. For mains, those not hankering for a meaty dish had the option of a silverbeet and two-cheese filo pie; or if after aquarian meat, house-cured salmon with chickpea, zucchini and tomato. Both of our mains, however, featured meat of the redder variety. 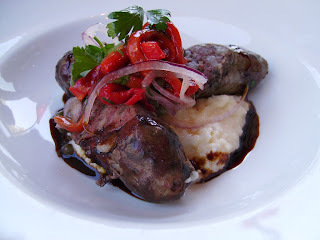 Firstly, the bull boar sausages, served with potato aioli, jus, roasted pepper and capers. The plump sausages had the coarse, dense texture of cured meat and were almost bursting against their skins with both fullness and flavour. This was offset by the moist aioli and the peppery and garlic flavours were balanced by the capers. My main (my second preference after the bull boar sausages, to be honest, but where's the fun in ordering the same thing?) 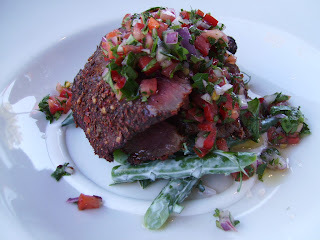 was chargrilled beef, dry-rubbed with sumac and chilli, served with green beans, fetta dressing and jalapeño dressing. The waitress had enthusiastically told us it 'packed quite a hit' (hence it's unsuitability for SG!) and she was quite right! It made for a great contrast, however. The meat was more grill-kissed, than chargrilled, so the spicy outer layer stood in for the crisp, sticky exterior of a longer-cooked piece of meat, and added grunt to the chewy flesh. The desserts were just exquisite. 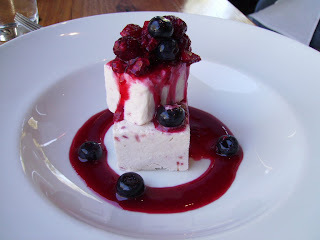 A white chocolate and raspberry parfait had SG moaning in delight and threatening to establish a life long relationship with his dessert and even just looking at it I didn't blame him. I was experiencing similar feelings of devotion to my chocolate pudding, with ganache and espresso ice cream. 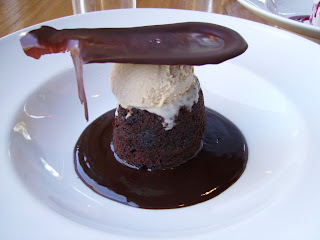 It was so indulgent, with the cold creaminess melting into the chocolate sauce and both soaking into the spongey pudding, creating a fusion of those two great beans, cocoa and coffee. A thoroughly civilised, enjoyable afternoon, spent in the company of notable food, happy diners and helpful staff. They're very tall desserts, aren't they? Indeed they are! And in the case of the chocolate dessert, all the better to tumble over once it has reached the table so everything can mix together!